in honor of easter (yesterday), i thought i would put up some tips on hard boiling eggs, thanks to the kitchn. it was only a few months ago that i even realized there was a difference between hard boiling and soft boiling eggs - i'd never even thought anyone would want a soft-boiled egg. check out this post about hard boiling egg fun and this post about a tip to date hard boiled eggs for maximum freshness. here is another tip for getting the perfect hard boiled egg. and finally, what to do with leftover hard boiled eggs. so, this raises the question: did you hard boil eggs to decorate this year? and after you decorated them, did you eat them? or what is your favorite way to eat eggs? i'll answer my own questions! 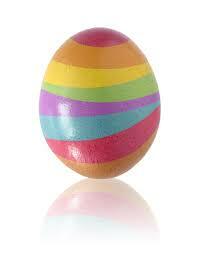 i love hard boiled eggs and am eating one for breakfast today, but i did not decorate any this year. and this is probably my favorite way to eat eggs. i am not a fan of scrambled eggs. wait what's a soft boiled egg? Lentil Stew - a twist! Blue Cheese Brown Rice "Risotto"
Do you bring your lunch to work?